While visiting Mom recently, you picked up on some subtle, yet concerning changes. She seemed to struggle more with remembering the names of family members. She misplaced her keys not just once, but three times. And she mistakenly substituted salt for sugar when making her famous strawberry shortcake. Are these normal signs of aging? Or could it be something more serious, like Alzheimer’s or another type of dementia? At To The Rescue, we understand how hard it can be to discern between what’s normal as we grow older – such as mild forgetfulness – and the more degenerative and progressive symptoms of Alzheimer’s disease. Since we know that knowledge is empowering, we’d like to share the following red flags of Alzheimer’s. If two or more of these signs are noted, it’s time to talk with the senior’s physician. Short-term Memory Loss. While some degree of memory loss is inherent with aging, one of the hallmark symptoms of Alzheimer’s disease is the impact on short-term memory, while longer-term memories remain intact. Personality Changes. With Alzheimer’s or other types of dementia, judgment can be impaired, resulting in a more outgoing personality, even if the person has been previously quite shy. Depression and loss of motivation are also quite common in dementia. Rapid mood swings for no apparent reason are another sign to watch for. Repetition. Repeating the same story to the same person over and over again can be one indicator of Alzheimer’s, but the person may also repeat familiar tasks, such as brushing teeth or hair, or begin to collect an overabundance of certain items. Trouble with Daily Tasks. Take note if the senior has always enjoyed a particular card or board game, but begins to forget the rules; or, if he or she struggles with any routine tasks that once came easily, such as housework, yard work, cooking, balancing a checkbook, etc. To learn more about the signs that may indicate Alzheimer’s disease, or for helpful, educational resources, contact To The Rescue. 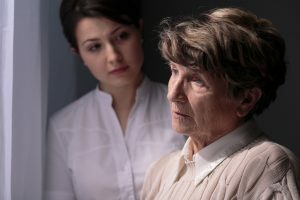 We provide expert Alzheimer’s and dementia care, customized to each individual’s needs and uniquely appropriate for each stage of the disease. Our services range from professional nursing care to physical and occupational therapy and non-medical assistance with personal care, housework, companionship and more. We also provide specialized care for those with a variety of other disabilities. Contact us to learn more about how we can help your loved one thrive and enjoy a higher quality of life. You can reach us by phone at 720-851-2100 in Colorado, or 319-826-6068 in Iowa, or by completing our online contact form and letting us know more about your specific situation.